Welcome back. Actually, you may not want to visit. Today’s blog post is a downer, magnified by what’s going on in Washington. I’m going to review the recently published findings of a University of Arizona researcher, who determined that climate change has already been responsible for the local extinctions of hundreds of animal and plant species. 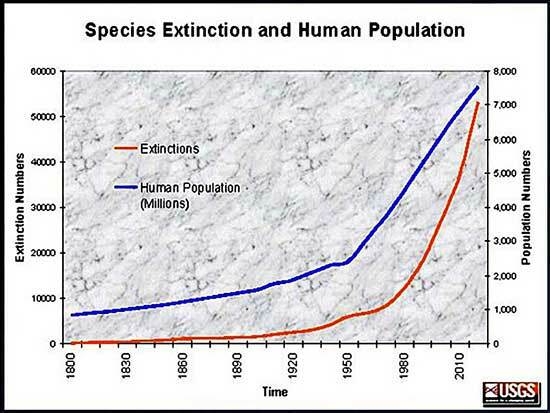 Local extinctions impact biodiversity, the variability among living organisms from all sources. A reduction in biodiversity can impact the dynamics and functions of ecosystems and have severe consequences for human well-being. A different recent study--this one by collaborators from the UK’s University of Cambridge and Yale and George Mason universities--suggests ways to open this discussion. Because of the increasing politicization of climate change and the “disinformation campaigns” organized by vested interest groups, I should at least note that 97% of climate scientists have concluded that human-caused climate change is happening. Nevertheless, whether the change is driven primarily by humans or not, the Earth is getting warmer. The change is a threat to global biodiversity if the world’s animal and plant species can’t adapt, for example, by moving to cooler environments. The University of Arizona researcher’s findings regarding local extinctions were derived from 27 published studies that documented shifts in the geographic ranges of species in response to climate change. Such shifts typically encompass overall movement of a species toward higher latitudes and elevations, with expansion at the cool edge of the species range (higher latitudes and elevations) or contraction at the warm edge (lower latitudes and elevations), or both expansion and contraction. A warm-edge contraction indicates that the species is not shifting enough to tolerate the new conditions and is instead going extinct. The researcher identified the 27 studies by searching the Web of Science, an online subscription-based scientific citation-indexing service, between December 2014 and March 2016. He included all studies that both monitored the warm edge of at least one species’ range and linked their results statistically to climate change. In all, 976 unique species were surveyed (716 animals, 260 plants), distributed over a variety of climates, regions and habitats (e.g., Asia = 332; Europe = 268; Madagascar = 30; Oceania = 58; North America = 233; South America = 55). Of the 976 species, 460 or 47% had warm-edge contractions indicative of local extinctions. The loss of 460 species, even if local, sounds like a lot, but I needed some perspective. I found a 2011 study that estimated the total number of species on Earth to be about 8.7 million (give or take 1.3 million), with 6.5 million on land and 2.2 million in oceans. Losing 460 out of 8.7 million species wouldn’t even be noticed, or would it? Although the 27 studies were not performed or selected randomly to represent the population of all species, they did show a 47% loss. That’s high enough to get my attention. Plus, the 47% loss was not experienced uniformly. Tropical species, for example, showed a 55% loss. Most important, those local extinctions were in response to a small increase in global mean annual temperature. What will be the response if the predicted increase in global warming over the coming decades occurs, especially if we continue to remove habitats and paths of dispersal, thus interfering with the ability of species to adjust? Oh well, maybe those climate scientists are wrong. Thanks for stopping by.